Dunno if anybody loves doing tree work, im learning it atm, I'm more used to cutting hedges, but this guy I work with has balls of brass. Hes a gorilla. No fear whatsoever. Had to do it like that as its surrounded by clay lined ponds. Notice the ratchet straps at the bottom? The twin had rotted out, so had to ratchet them to hold em together/stop them splitting whilst he chogged it down. Its my second job, not got all my tickets yet, still saving. 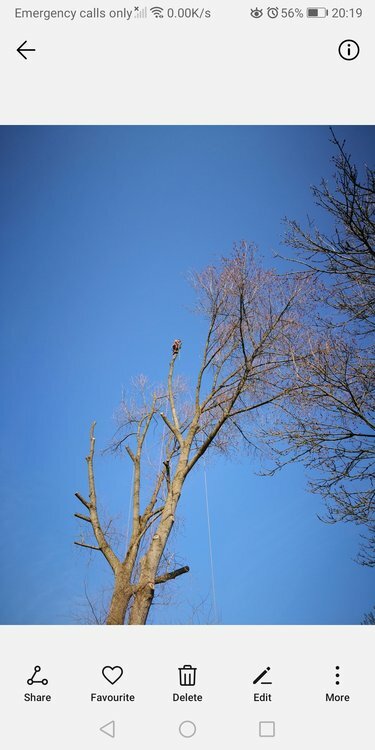 Do it tho, get them all, tree rescue, cutting at height, it's bloody good money, bloody expensive tickets tho. And gear. Knowledge of tree species and their faults and problems can be a lot life saver. Learning from the old hands is invaluable. 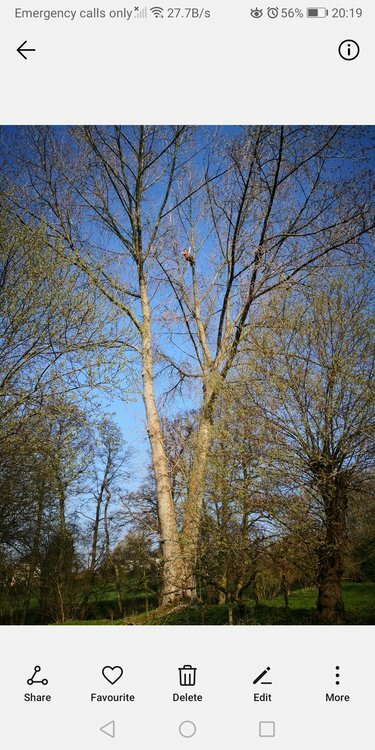 Used to love climbing to silly heights in large mature trees. Not anymore I found I don't bounce as well as when younger, good luck in getting all your tickets and doing the job. 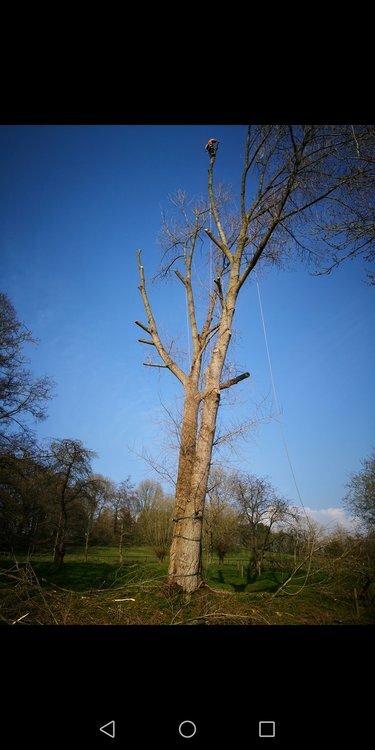 Did my first pollard like that the other day, worked on rope access stuff loads before and it's the swing when you drop a big branch that gets me, really good fun though. When I was a young lad I used to climb trees like that for birds eggs. Are you old enough to remember the elm trees old'un? No branches on them till you nearly got to the top and only twigs to climb on along with ivy where you found the birds nests. I am amazed i am still here to talk about it, we were crazy back then. Come back down with three or four eggs in your mouth. I like most kids in the 50s/60s had a birds egg collection, if I think back to some of the eggs I had I would be in the dock today charged with wildlife crimes, how things change, strangely enough it did not seem to have a big impact on bird numbers considering most young lads had a collection, mind you we had an unwritten code of only taking 50% out the nest and if the eggs were haggled we would climb back up the tree and replace them. 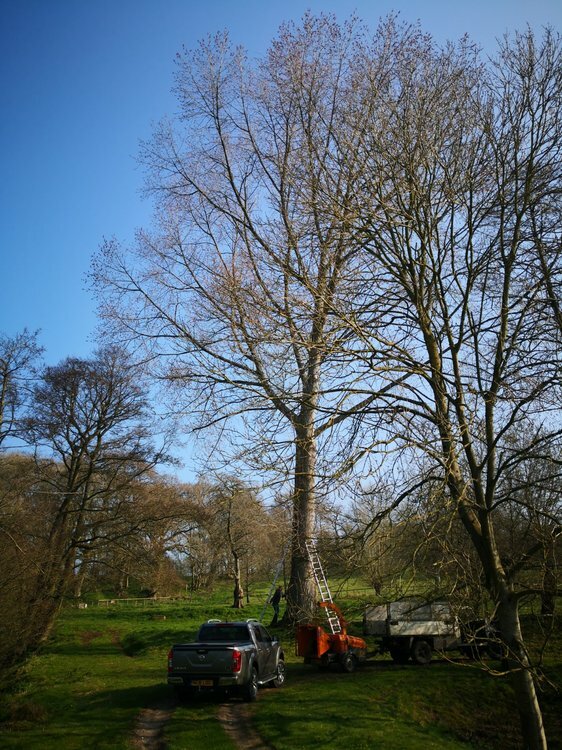 Like you say its amazing how more kids were not killed or seriously injured climbing some of the trees to reach birds nests high in the tree canopy and on the thinnest of branches, I shudder now thinking of some of the trees I climbed after rooks and crows eggs. Used to walk the hedgerows and yellow hammer nests where ten a penny and in the summer flocks of them in the hundreds would fly up the lane infront of us, now it is a bonus to see one pair. Squiggle birds we called them because of the markings on the eggs. One to keep and a couple to trade at school was all we took. As said, how times have changed.